Software developers and companies may sign software programs they develop or distribute which is used to validate the integrity of the program to ensure that it has not been altered after it has been signed. 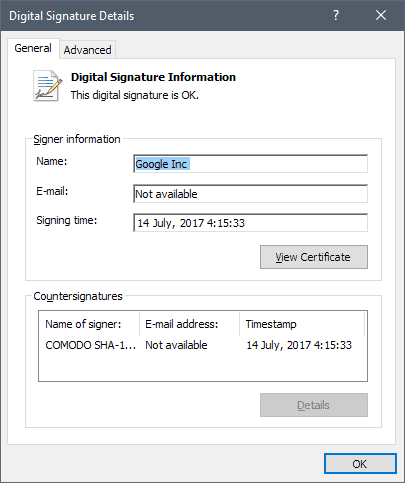 The following guide lists several methods to verify digital signatures of programs on a computer running Windows. You can display and verify the signature of any program on Windows using Explorer. Step 1: Right-click on the program that you want to check and select properties from the context menu that is displayed. Step 2: Select the Digital Signatures tab in the Properties window. Step 3: If you see signatures listed on the tab, you know that the file has been signed digitally. Double-click on one of the signatures to display further information. Windows lists the signer information and countersignatures in the window that opens. You may click on View Certificate to display the signature or click on the advanced tab to display signature details as well. 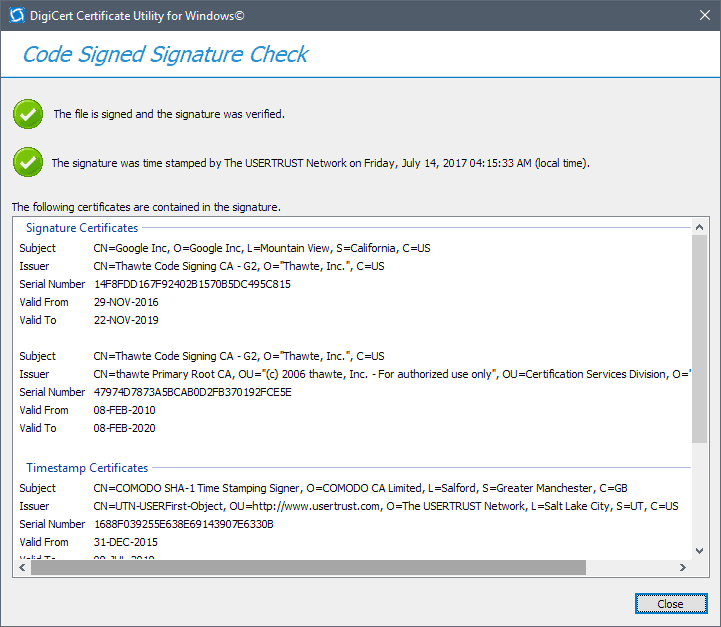 Windows reveals to you if the "digital signature is ok", or not. SignTool is a Microsoft program that is included in the Windows SDK. The program is not included when you install Windows on a machine or use Windows, and needs to be added to the system by installing the Windows SDK. Note: The download has a size of about 2.5 Gigabytes if you download the Windows 10 SDK. It will install all sorts of files on the system that you don't require if you don't develop Windows programs. SignTool verify program.exe -- Defaults to the Windows driver policy for verification. SignTool verify /pa program.exe -- Use this to verify code-signing certificates. You may download the Digicert Certificate Utility for Windows to check application signatures on the operating system. Run the program after download. It does not need to be installed. On the "Code Signining" tab, select "check signature" in the header. Select the program that you want to check using the file browser that opens. 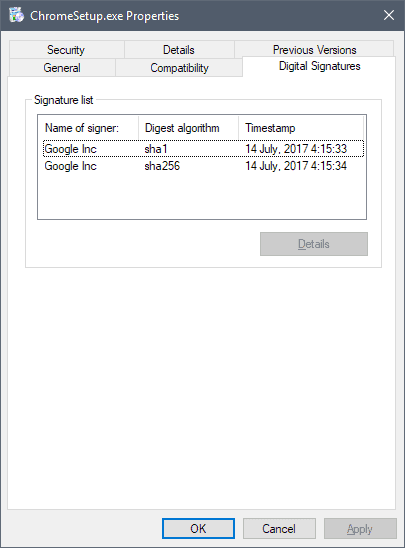 DigiCert checks the signature and displays information in an extra window. It checks whether the file was signed and if the signature validated. It checks the timestamp of the signature. If you get green checkmarks for both checks, verification was successful. While most Windows users may have no need to verify the signature of programs, it may be useful to developers, researchers and advanced Windows users. Find out how to verify the digital signatures of programs in Windows using built-in tools and functions, and external programs. I hate how they make it difficult to get those standalone SDK exe’s, they are useful but who wants to install all that to get a few 100K exe’s, I wish they would make them available separately like SysInternals. Agreed, lots of people search for individual executable files they would like to use. Martin, you reported back in 2014 about the file files & folder check program Sincheckgui and the website is still up and running do you think this program will work, (It did with Windows 7) with Windows 10? Paulus, the issue with Virustotal is resolved. The program works just fine under Windows 10. ” Select the Digital Signatures tab in the Properties window. “……………?? 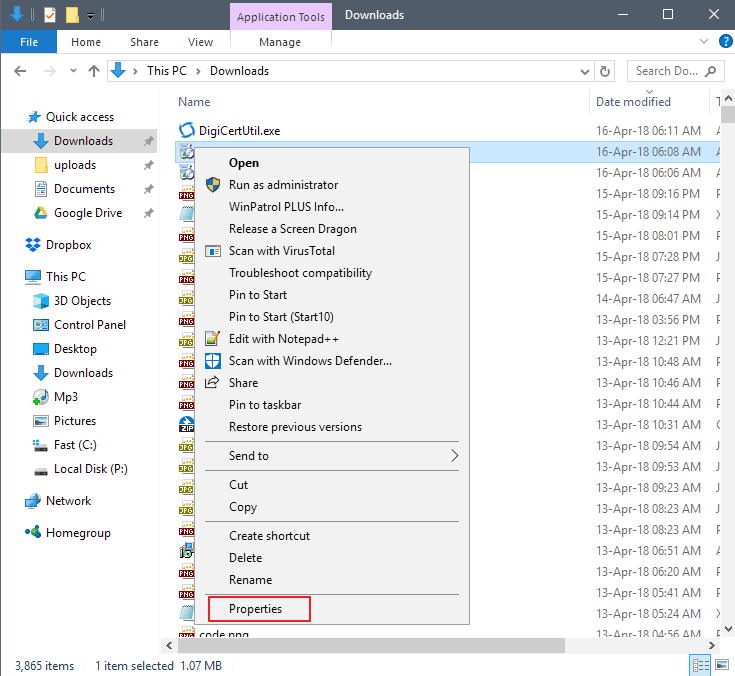 Can not find this tab in my latest Win10 !! How can ………?? Did you right-click an executable file? Yes, on some exes its present indeed , but not on all exe-files………….! Hey, Martin, could you do a “how to verify Tor browser bundles” article? Particularly for Ubuntu linux. I can never seem to quite understand it. Worse still, it would appear from the second to last paragraph that Microsoft doesn’t intend to fix the problem in “current versions” of Windows which presumably includes W10. I was trying to use Sigcheck today but the command prompt window closes instantly as soon as the app is run. Any ideas on that aspect? Forget about my question re: running Sigcheck please. I figured it out.